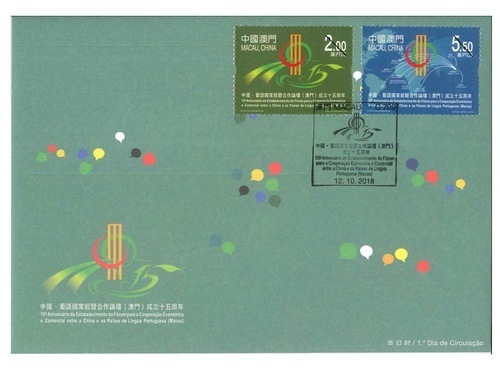 Stamp Issue "15th Anniversary of the Establishment of the Forum for Economic and Trade Co-operation between China and Portuguese-speaking Countries (Macao)"
To celebrate the 15th anniversary of the establishment of the Forum Macao, Macao Post and Telecommunications Bureau will issue the stamp theme “15th Anniversary of the Establishment of the Forum for Economic and Trade Co-operation between China and Portuguese-speaking Countries (Macao)” on 12th October, 2018. 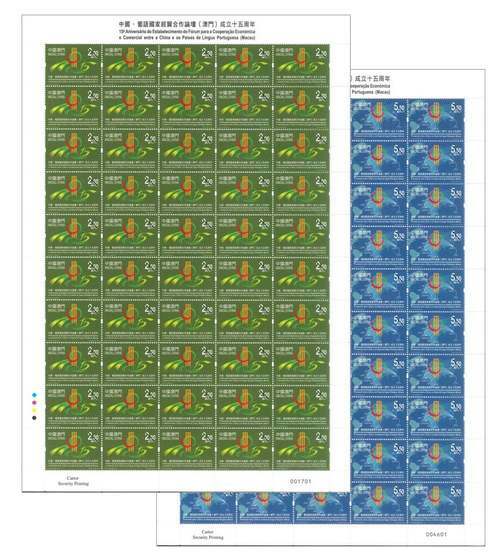 This issue includes a set of two stamps and one souvenir sheet. 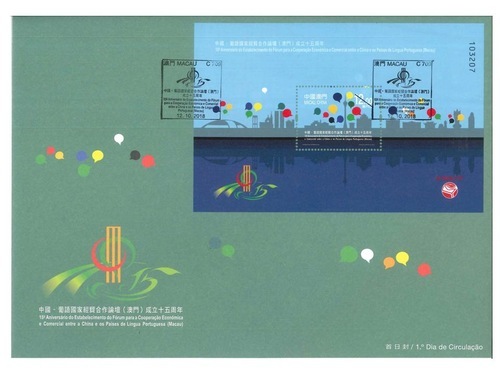 The Forum Macao, was established in October 2003, it was an initiative by China’s Central Government, organized by China Ministry of Commerce and implemented by Government of Macao Special Administrative Region. 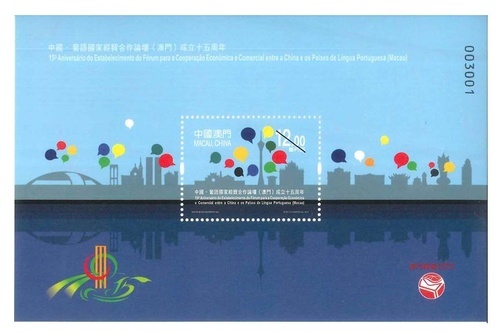 Participating countries of Forum Macao include China and eight Portuguese-speaking countries, namely Angola, Brazil, Cape Verde, Guinea-Bissau, Mozambique, Portugal, São Tomé and Príncipe, and East Timor. 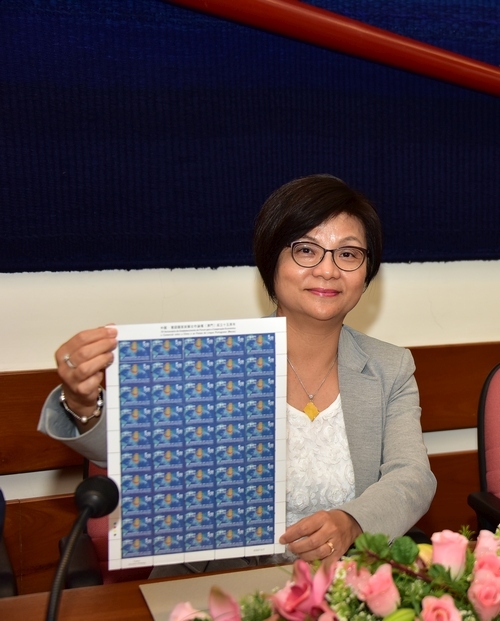 Macao is committed to developing as the bridge and connecting platform, to strengthen economic and trade cooperation and exchanges between China and Portuguese-speaking countries, and to promote common development. 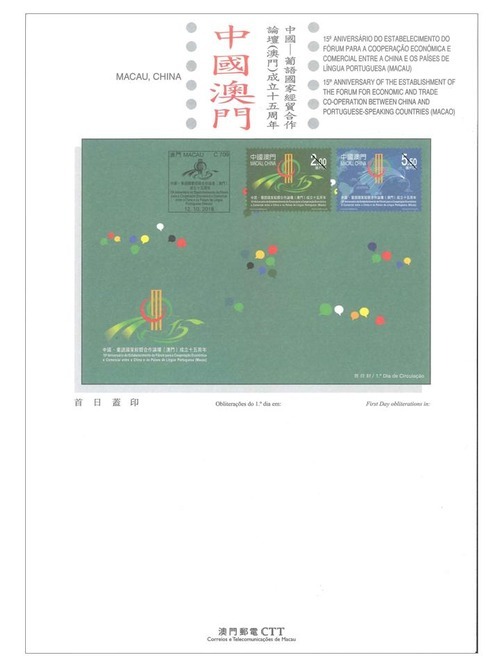 The stamp designer of this issue is Mr. Victor Hugo Marreiros, and the text of the information brochure is written by the Permanent Secretariat of Forum for Economic and Trade Co-operation between China and Portuguese-speaking Countries (Macao). This is the tenth theme in 2018. 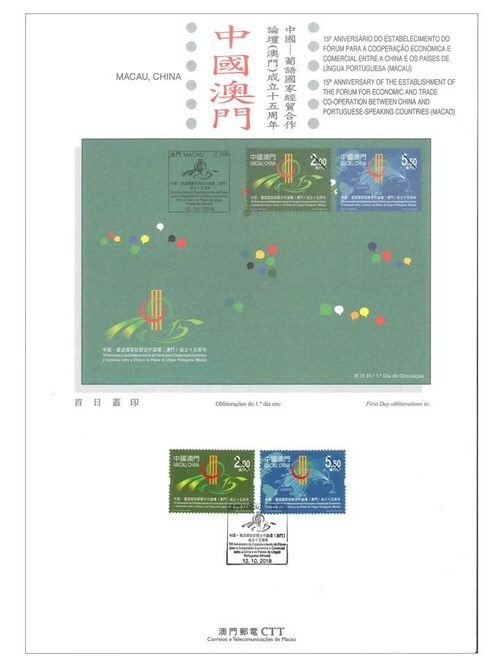 The previous issued stamps are “Lunar Year of the Dog” on 05/01/2018, the label stamp “Lunar Year of the Dog” on 31/01/2018, “Macao 2018 – 35th Asian International Stamp Exhibition (I)” on 01/03/2018, “Mainland Scenery VII” on 12/04/2018, “Classic Fables and Tales” on 30/05/2018, “Joy” on 26/06/2018, “Chapas Sínicas (Chinese Documents)” on 06/07/2018, “Masters of Chinese Literature – Tang Xianzu” on 27/07/2018, “60th Anniversary of the Publication of Macao Daily News” on 15/08/2018, the label stamp “Macao 2018 – 35th Asian International Stamp Exhibition (II)” on 21/09/2018, “Macao 2018 – 35th Asian International Stamp Exhibition (III)” on 23/09/2018, and “Birdsongs and Spring Flowers” to be issued on 09/10/2018. 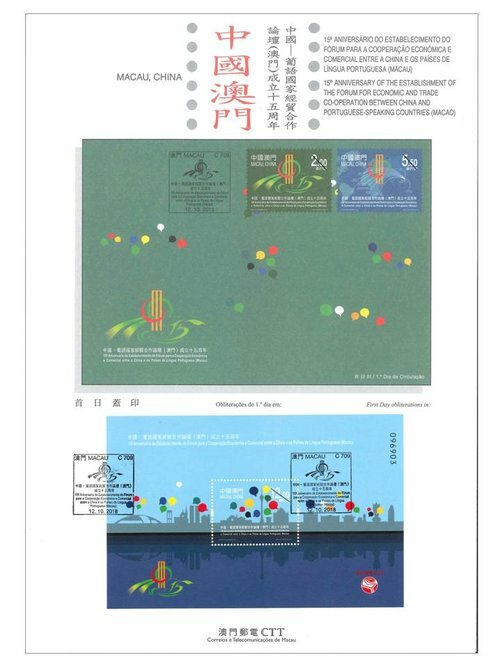 Technical Data of Stamp "15th Anniversary of the Establishment of the Forum for Economic and Trade Co-operation between China and Portuguese-speaking Countries (Macao)"